Thrive Tomatoes have been sun-ripened to perfection. Use them to make hearty soups, fresh salads, and tasty salsas and sauces. 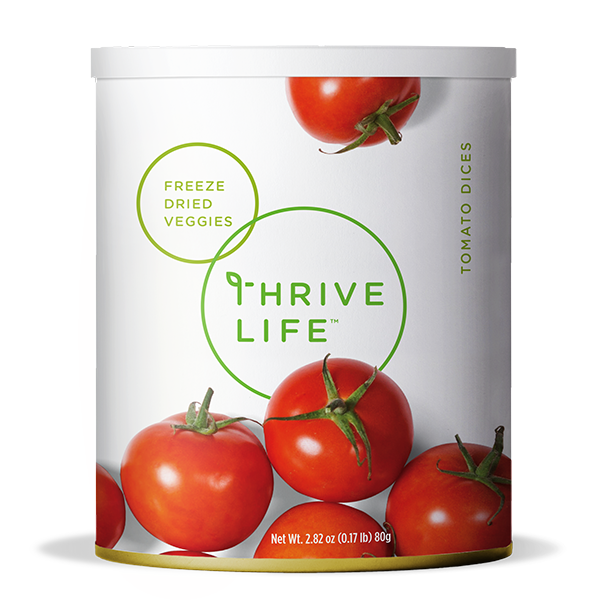 Each bite you take of Thrive Tomatoes will give you the vitamins and antioxidants needed for your active lifestyle. Add 1/3 cup of water to 1 cup Tomato Dices; let sit covered for 3-5 minutes or until tender. The dices are peeled and seeded, ready for use in soups, stews, pastas, and rice dishes. Because tomatoes are so delicate it’s best to wait to rehydrate the tomatoes right before you plan to use them and to add them at the end of a recipe so they don’t get too soft. Rehydrate and oven dry them for tasty sun-dried tomatoes.